Furniture is one of the most significant purchases that we have to make during our lifetime. Just take a look around yourself. You will notice that furniture occupies majority of the space. You have furniture in your bedroom, your living room, your kitchen and even in your bathroom. The fact is that we all have become so much accustomed to using them that a home without furniture is hard to imagine. They are purposeful and ensure a comfortable lifestyle. Another reason to put pieces of furniture at homes and workplaces is that they add beauty to the surroundings. They can reflect our taste and can also be aesthetically appealing. Summing all this, it can be said that furniture plays two roles: functional and aesthetic. It is due to these roles that furniture today has become a part and parcel of our lives. However, what many people forget is that a good care regime is crucial for maintaining the overall quality of furniture. Most probably, people invest their time and efforts in buying the right furniture, but once it comes home, they just place it wherever they want and that is it. This is one of the biggest mistakes that is generally made and should be taken care of. After buying furniture, you must make sure that it stays sturdy through many years. Your sole aim should be to extend its life so that you do not have to invest in a new one frequently. So, do remember that your responsibility is not just limited to buying ideal furniture but also to taking good care of them afterwards. Whenever possible, try to protect the surface of furniture with a mat. This will prevent any scratches and damages that are very likely to develop because of the accessories placed on it. If your wooden furniture has become an attractive area for insects and termites, take action instantly. Apply insect-resistant coatings on it. Furniture pieces like those made from oak have a natural property to resist fungal and insect attacks. If your furniture needs a touch-up, then you may do so at home. However, the weather must be checked beforehand. Do not perform this task if humidity levels in your area are too high. Wait for a dry day so that the varnish or paint dries off quickly. If you hear squeaks coming from metal furniture, smear the rivets with oil. It will solve your problem almost instantly. If your wooden furniture makes noises, you may be required to re-glue the parts that have become loose. An application of furniture oil on wooden furniture is also a good idea and you can do so 3–4 times a year. 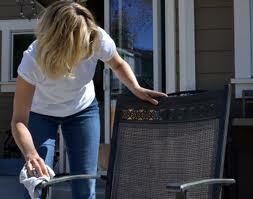 Lastly, just like anything else, you must clean the furniture on a regular basis. You may also use a vacuum cleaner to make it dirt free at the corners. If nothing else, then at least wiping it daily with a cloth and cleaning spots and stains from the surface will increase its life.